This Grilled Pineapple Salsa is packed with sweet pineapple, spicy pepper, and juicy tomatoes. 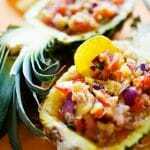 And with only eight ingredients, you’ll have this delicious pineapple salsa ready in no time. For chunky salsa, roughly chop all fruits and veggies and toss with seasoning. For less chunky salsa, throw everything in a food processor and blitz a few times until it reaches a consistency to your liking. For major yums, add this salsa to these Crispy Baked Avocado Tacos! Recipe from Live Eat Learn at https://www.liveeatlearn.com/grilled-pineapple-salsa/.